Alloy Silverstein invites you to a dynamic panel presentation on precautions business owners can take to protect their business data and employees. But, cyber criminals are targeting small businesses. 60% of those who fell victim to an attack or breach were out of business within six months. And the threats don’t stop with hackers. Do you have a disaster recovery plan in place? Have you thought about infrastructure interruption? Downtime, data loss, and breaches are very costly, but precautions are available to help mitigate risk. 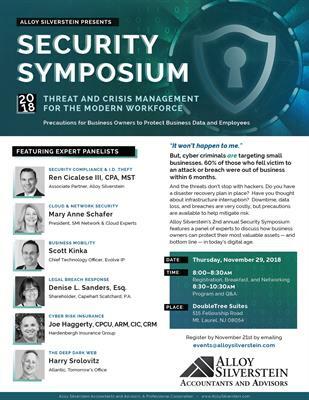 Alloy Silverstein’s second annual Security Symposium features a panel of experts to discuss how business owners can protect their most valuable assets − and bottom line − in today’s digital age. South Jersey business owners and influencers are welcome to join us at the DoubleTree Suites (515 Fellowship Road, Mt. Laurel, NJ 08054) on Thursday November 29, 2018 to learn more and hear from our expert panelists. Breakfast will be served. To register, email events[at]alloysilverstein.com by November 21st. Free with advanced registration. Breakfast will be served.